Before we go further, I want to quote one of the comments from yesterday. This is from a long-time poster named Shutter, who I really appreciate being one of our regular readers. As someone who makes/sells games, here’s my question: If you don’t want us to stop putting out DLC, would you rather have the base game priced at $100, or for us to go back to Xbox/PS2 graphics and fire half the studio? Because those are the options without doing DLC. DLC and loot crates exist because the current base game pricepoint doesn’t keep dev studios solvent for the non-CoDs/GTAs of the world. Yes it’s meant to get your money, but so is selling the game in the first place. And as a gamer I’ll say that DLC is good and lets me play what I want at a price closer to where I actually value it. There are plenty of games that I’d like to experience but I don’t want to 100% (Hi Assassin’s Creed). DLC lets me play the game for the 10-20 hours that I care about, but not have to subsidize the people who are sinking 100 hours into the game to find every collectible. I’ll also add, I’m perfectly happy for people not to buy the DLC attached to games I work on, if people quit buying it, we’d quit making it. But for all the bitching about DLC, the reality is that there’s a solid chunk of people who want this stuff and will buy an incredible amount of it, and they’re subsidizing the base game dev for the rest of us. I really like this comment because it opens up the discussion for these value propositions. I’m going to use these value/price points in a slightly different way than usual since these are typically used to compare an offering to the competition or the market. I’m going to use them to compare to their base games. It’s not perfect, but it’ll do well enough to illustrate my point. Would I rather have a base game priced at $100? I usually have no problem paying ‘more for more’. That’s how I rationalize buying Apple products, BenQ monitors, TVs with the good Samsung panels, leather in my car, etc. I will pay more, but I expect more in return. To me, this is what MMOs do in general. They cost more, but you (hopefully) get more. That’s why I’m okay with a subscription. As soon as that value/price position wavers, however, my subscription usually cancels. For a single-player game, I’d pay $100 for a great game. Sure. My imagination starts to churn out all sorts of ideas like the next Elder Scrolls game or an even better Assassin’s Creed. I get lots of enjoyment out of those games and would likely pay $100 for the ones I knew would meet that ‘more for more’ value. If we pretend there’s no risk of a bad game, then Yes I would pay an additional $40 for a game with no DLC or mtx. But since that risk exists, you’d be putting games into the same quadrant on the FCB matrix as an iPhone, and that radically alters my perspective. The purchase decision, for me, goes from almost-impulse to high-involvement. Do we want games in that category? This would make a fascinating blog post for another time. I don’t like paying more for less. This is where I always feel like the season pass is a scam. This is value/price trap where I always feel like the DLC never amounts to the value paid. The Destiny 2 DLC is mopped up in an hour or two. That was $20. That’s 1/3 the box price for the full game. Looking at it from that perspective, I just paid more for less. Reskins, pointless levels, and small maps. No thanks. And to my point yesterday about DLC segmenting the community, the Destiny 2 DLC actually takes away features you paid for in the base game if you don’t also buy the DLC; That’s right, you can’t Prestige Raid, Nightfall, or do Trials without the DLC. They’re essentially locking you out of content you already bought. That, to me, is like ‘paying more for less’ to the nth degree or bottom line ‘more for the same’. They want you to think it’s ‘More for Less’. They want you to think you’re getting more content for such a low price, but that’s a manipulation, not a correct way of evaluating the value/price position. As many pointed out — and I agreed — in yesterday’s comments, there are good value offerings in the DLC space. These tend to be more EXPANSIONS than DLC, though. They’ve just been categorized as DLC due to the nature of their release being digital these days. In many ways, I lump WoW expansions into this category. Comparing their value/price to themselves, the expansions are ‘more for the same’ or ‘same for the same’. If ‘same’ was good for you, then celebrate. Elder Scrolls DLC tends to be be a great value. Baldur’s Gate 2: Throne of Bhaal was awesome value. I remember thinking the Mass Effect 2 DLC was good. Assassin’s Creed 2 DLC was really good — probably the best of the franchise with Black Flag having a good installment. The gems are there. This is where people like to jump in and say that I was generalizing yesterday. Yes, I was. Generally speaking, most DLC is hot garbage. Most DLC doesn’t fall into the positive quadrants. Most DLC falls into the negative areas. DLC is trending heavily toward a predatory practice — no, strike that, it’s already there. So when I say DLC is just as bad as loot boxes, I truly do believe it. They are both predatory by nature, rarely provide the value and positive emotion, and typically do not benefit the consumer. I’m commenting so that I can get my daily loot badge. For the most part I agree with everything you’ve said Keen. I’d go so far as to say anything in those areas marked in green is so rare for DLC to be worth the price that its like finding a four leaf clover, in January, in Alaska, topped with a winning Powerball ticket. If anything it is rare to find even a good DLC that is worth the price. Its rare but I can only think of a few game companies can value their brand over short term profits. Blizzard’s Diablo, (much less lately but they were doing good for a while) Terraria, and Stardew Valley are games that come to mind. That’s a fair analysis of the situation as it affects the rational consumer…but we all know that most consumers are far from rational. One thing that often gets overlooked is peoples’ desire to just buy stuff because buying stuff makes them feel good. It’s the unhappy people, the ones with buyer’s remorse or those who feel they’ve been ripped off, who make all the noise but behind them there’s an army of people spending money on stuff they don’t need, often which they won’t even use, who feel good about doing it. I know plenty of them. This probably applies even more to MTX and lootboxes than DLC but it works across the board. People who don’t have the reaction find it hard to understand – or even believe – but for a lot of consumers the value comes at the moment of making the purchase. What you are buying is the act of buying. It would be very interesting to see the statistics on how much use the items and access that are bought actually receive. If it’s anything like the unworn clothes, unread books or unwatched DVDs filling the shelves and closets of my friends and associates then it won’t be much. I have even known people who will repeatedly buy additional copies of things they already own, because they know they like that thing and buying it again gives them pleasure. I work with someone who does that not infrequently and is pleased to do it. You can’t assume that someone else’s value is yours – or that it’s anything you would consider rational – or even sane. Well said, and that makes sense. I am totally someone who makes irrational buying decisions at times. I’m buying Skyrim again on the Switch. I beat it already on PC. It’s probably even better on PC. But it’s SKYRIM! And it’s mobile now! Even saying that I know I’m being silly, but it brings me pleasure. So I do it. Probably the same reason I buy a new phone. Ideally, laying down a $100 for an entire game sounds ideal to me. I fear however, that the public might accuse developers of “ripping” them off. The problem with the game’s industry, is that the cost to make a game has risen exponentially. Originally, games didn’t require large staffs of artists, programmers, game designers, writers, network engineers, sound engineers, musical composers, and producers… a game was wired by just one electrical engineer. The invention of the microprocessor changed everything, and by making games tied not to the console like the Magnavox or a Pong box, games were tied to replaceable cartridges. The responsibility of making the game shifted from the hardware engineer to the software department. As hardware has become increasingly powerful, the process to make games has become more complex. New specializations are appearing, such as VR and motion capture. As technology improves, so too do consumer expectations. The game’s industry has had steady growth in sales year after year, but the cost to make the game grows exponentially. Developers have to make their money back, and one of the best ways to do that is through DLC. Because the vast majority a game’s players (up to 90%) will have moved on from a game within three months after it’s launch, developers who are going to sell DLC NEED to start working on it ASAP, and inform the consumer that it is coming. It’s the reason why when you buy and new game and open up the box to pull out the disc, only to see on the inside cover a paper saying “DLC coming in a couple weeks!” and you moan that the developers didn’t just delay the game so it could be on the disc, or accuse developers of cutting out content to sell it later. The standard $60 box price was set years ago, and hasn’t accounted for the inflation that occurred after the 2008 crash or the rising cost to make games. If DLC is only successful for the first few months after a game launches, then one’s options for making back their money is limited. One option is to turn the game from a product (you buy it, you play it) into a service model (microtransactions or a subscription) and support the game over a long period, hoping to receive a constant stream of revenue over that period. This works best for multiplayer games like Overwatch, WoW, DotA2, etc. The alternative is to raise the box price or break up the game into multiple parts. 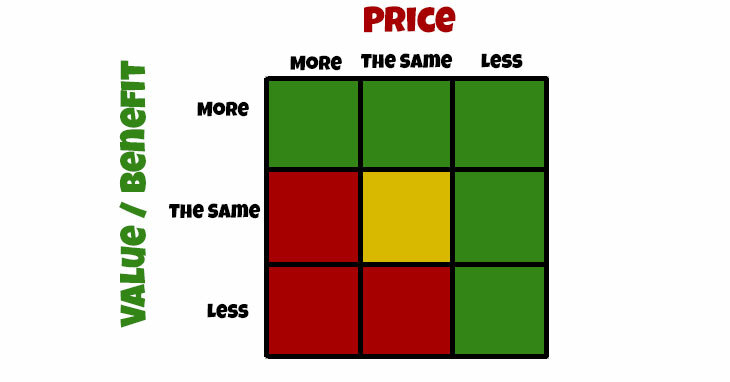 The problem with raising a box price, is the perceived notion by consumers that because they are paying for more, they should get more. Let’s hypothetical say, that an imaginary company is making a linear 3D RPG, with a 30 to 40 hour long story. Since that’s in the ballpark of the amount of content similar games sell for $40-60, it’ll be fine. But now, if I charge $100 for that same game, people will compare it to other RPGs that had a similar length and point out that those games only cost $40-60. Furthermore, as much as we would like to say that no one wants a $100 collector’s edition, we can’t deny that they are effective. When the marketing department puts up the flashy $100 price tag for a collector’s edition on a game’s website, it makes the $60 standard edition look cheap by comparison, and consumers will be more likely to think of the $60 standard edition as a good deal. I’d imagine that the same concept would apply if consumers had to decide between laying down $100 for a game, or $60 for another, even if the $100 game had more content. It’s no-brainer which one consumers will pick. I think the solution that would work out for everyone (and has worked out for some developers for a few years now), is to simply break up a massive game into multiple parts. This has worked wonders for Nihon Falcom, a middle sized studio of thirty people or so. They break up their games into two or three parters and releasing a part every couple years, thereby reducing the risk. The creators of The Banner Saga are using the same approach (although they had to use Kickstarter to get the ball rolling); they had a vision for a grand saga to tell, but they couldn’t spend 5 years developing a single game to sell for $60, so they’ve decided to break it up into a trilogy and work on the story one part at a time. AAA developer Square Enix has jumped on the idea with the Final Fantasy VII remake. Considering the sheer scope of the game, this makes sense and would have been my choice, but considering Square’s last two major RPGs Versus XIII and KH3 have spent years in development hell, and the VII remake seems to be stagnating (or it was announced far too early), I’m not going to hold my breath. I can’t believe that I am about to say this, but…. I’m almost now in the camp that everything should be subscription based to solve that problem That way, if you play a game for 1000 hours, and it takes you a year to do that, you pay the $150. If I am done with it in two months, I paid less. It encourages developers to make and create a lot of content, and people that love playing the game. It doesn’t penalize long term vs short term player investments. People pay into it what they are using. It’s kind of fair. That just results in a lot of time gating, filler, grinding, etc to artificially extend the length of the game to keep you playing longer. It wouldn’t result in better games – just games where it took you forever to do anything. Portal, for example, would not be a better game if it was longer. That doesn’t work. People stop playing/paying if they aren’t having fun. Simple as that, for whatever reason, be it the game originally isn’t fun to it eventually stops being fun because of gating/grind/filler/etc. People can call raid lockouts ‘gating’ all they want, but unless it stopped you from playing (and it didn’t stop the 10m+ in vanilla WoW), it’s not that. This is how I have been feeling when we saw the MMO genre shift away from sub to F2P. Now it has shifted back for a reason. Audioshaman is right about the gate gating and filler/grinding, but in a way that can be fine as long as it’s “fun” content. I think WoW is an example of how it’s done right or not. For the most part, the millions of people paying for subs don’t mind the filler and time gating and artificial inflation of stuff to do, but when they run out of things to do the subs get cancelled. This causes Blizzard to keep making more content. Interestingly, EA is coming out with a subscription model. They’re pushing future game development toward a recurring revenue model. It’s the same route as Netflix, Amazon Prime, Microsoft Office, Adobe Creative Cloud, etc. I am a bit of a hypocrite in this regard – I’ve played WoW for 10 years and still enjoy it, even though I know I’m being manipulated in a lot of ways. There is a certain comfort I find in slowly picking away at a goal over a long period of time. I do think these design decisions are better suited to some genres, though. A linear, story driven, cinematic game like Uncharted would really suffer from a lot of pointless filler while more open-ended games can actually benefit from it. In that case the subscription wouldn’t be the game, but to the publisher. Imagine paying Activision Blizzard $20/month and getting to play any of their games any time, new or old. Insert any publisher in there like EA, Sony, Ubisoft, Nintendo, etc. That’s where it suddenly makes sense to me. I’d pay $100 for a game, sure – but on one condition: it has to be excellent. Uncharted 4, Super Mario Odyssey, Breath of the Wild, Skyrim – these are all games I’ve played that I would happily have paid $100 for, even more. The problem for the industry is that most games aren’t excellent. There are a lot of very forgettable games out there – even huge budget AAA titles that are ultimately not that interesting. Not to mention with things like Steam you can count on almost any game being deeply discounted in 6 months. I can only speak for myself, but as I’ve gotten older I’ve become far more discerning with my gaming habits. I have more money than ever before, but far less time. I have a career, a family, a house, etc etc. As a student I’d play just about every major release that came out. Now I may buy 1 to 3 games a year at full price. There’s just so much out there competing for your attention. Not only do I have less time for gaming, there are just so many games to choose from. You realistically couldn’t play them all even if you had the time or money. I don’t really know where I’m going with this, except to say that it is very hard to compete in today’s entertainment landscape. The best of the best can charge whatever they want and people will happily pay. The games treading water in mediocrity have to resort to these shady DLC/MTX schemes in order to stay above water. You’re exactly right. Price can go up, but the quality overall has to go up too. Not every game can be a Mario Odyssey (easily worth $100) or a Stardew Valley (worth $100). That’s what I mean when I say the purchasing decision goes from low involvement to high involvement. That extra $40 crossing an imaginary line for me where I’d really stop and think hard about each purchase. If everyone had to stop and think hard, games in general would probably be a lot better. I would have paid $89.99 for complete versions of any game that came out this year. I have been very consistent in saying that I *want* to pay more money for the *complete* game. The problem is publishers won’t sell complete games for $100 because they’ll make less money off whales. If games started charging $100 per game I would probably be close to being done as a gamer. Probably wait for a year and buy it used if anything.